Although scientists can only hypothesize about the future of home fitness technology, Mark Harigian, known as the “architect of the anatomy,” has not only seen this future–he already helps create it in the homes of the rich and powerful. Boldly venturing where no one had gone before, Harigian, the founder of Los-Angeles-based Harigian Fitness, was asked to design the gym on TV’s starship Enterprise. A futuristic spaceship gym was not such a cosmic leap, because he already uses cutting-edge technology not only to custom-fit his clients but to heighten their motivation. The best way, he says, to get people to make the most of their equipment is by creating a personal workout environment that makes exercise exciting. Since motivation is very individual, Harigian works to uncover just what might propel his clients. He does a personal profile, finding what interests the person he’s designing for and what makes that person’s wish list. For one movie mogul who had always wanted to climb Mount Everest but was not ready to scale the entire mountain, Harigian set up a base camp on the mountain, helicoptered in chefs to re-create a five-star environment, and arranged for manageable day treks. He made videos of the landscape that the client could view during treadmill workouts. That way the client could employ fantasy to spark a workout reality. There are as many ways to motivate through design as there are people who want to exercise. Will a koi pond winding through your walnut floor induce you to spend more time on the treadmill? Or how about a plasma screen TV that plays favorite running routes, coordinated so that the treadmill track inclines to simulate any steepness shown on the screen? Or how about swimming or rowing to wave images coordinated with the intensity of the current programmed into your endless pool? A waterfall; personally engraved weigh-training equipment; super flexible subflooring; retro light fixtures a la Flash Gordon; a comfy leather sofa for the clubhouse effect; a 50-gallon copper soaking tub to soothe those aching muscles. Creating rooms these custom touches is all in a day’s work for Harigian, who as a trainer helped sculpt some of Hollywood’s finest bodies. “It has to be a room you want to be in,” said Harigian. 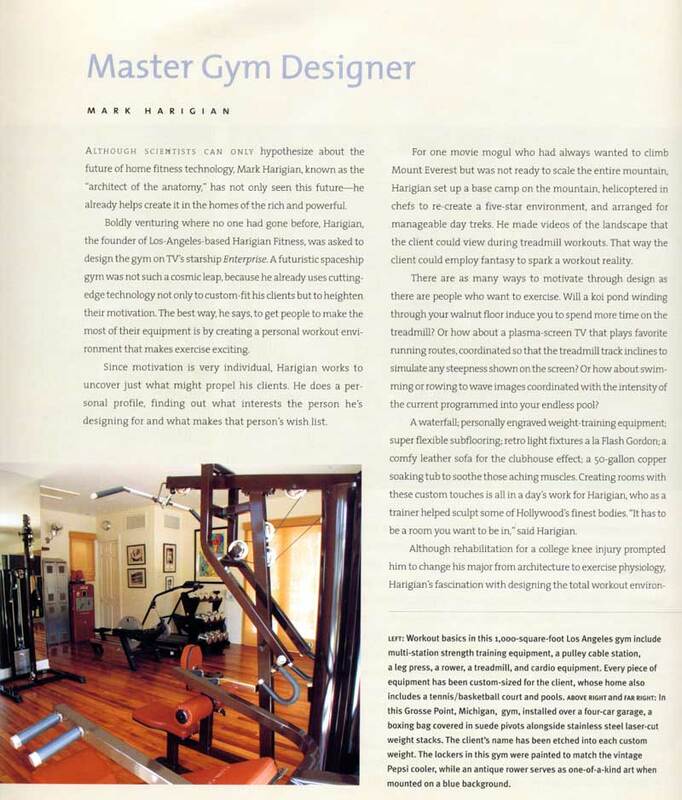 Although rehabilitation for a college knee injury prompted him to change his major from architecture to exercise physiology, Harigian’s fascination with designing the total workout environment began while he was training celebrities in their homes. 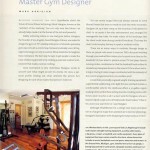 It heightened when his architect and designer clients would call him in for consultations on gym equipment. 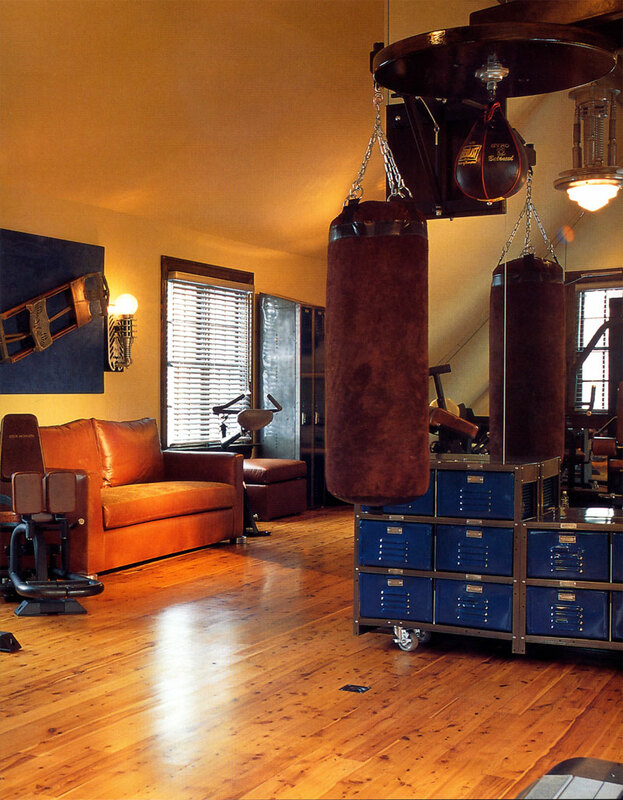 While consulting on a gym for Tom Selleck’s house, he noticed that the whole house was decorated in a Western ranch style but not the gym. 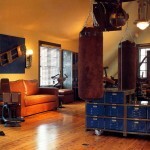 So, he went to a saddle maker and requested custom pads for the gym equipment. He put in a rough, distressed floor. 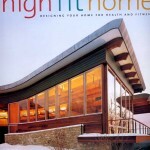 The interior designer loved it–and the rest was history. 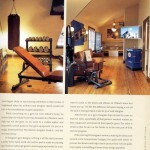 In Harigian’s gym designs, nothing is off the shelf, not even a pulley. Every bend, mold and custom part is made to exacting specifications. Although generic-sized equipment works for most people, custom equipment is extra important for, let’s say, an NBA player. For Shaquille O’Neal, Harigian custom-built equipment to scale, so the knees and elbows on O’Neal’s seven-foot frame line up. “It’s like the difference between buying a suit off the rack or having it tailor made for you,” said Harigian. 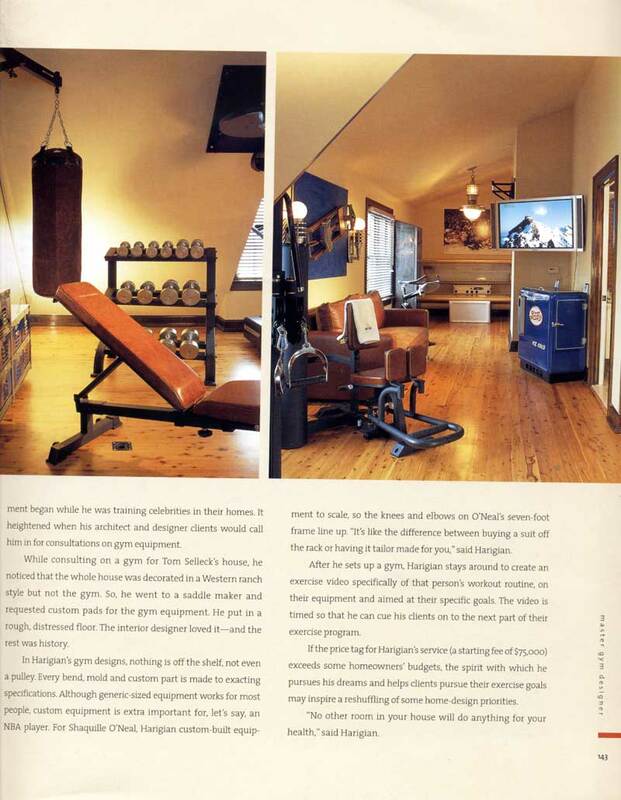 After he sets up a gym, Harigian stays around to create an exercise video specifically for that person’s workout routine, on their equipment and aimed at their specific goals. The video is times so that he can cue his clients on to the next part of their exercise program. 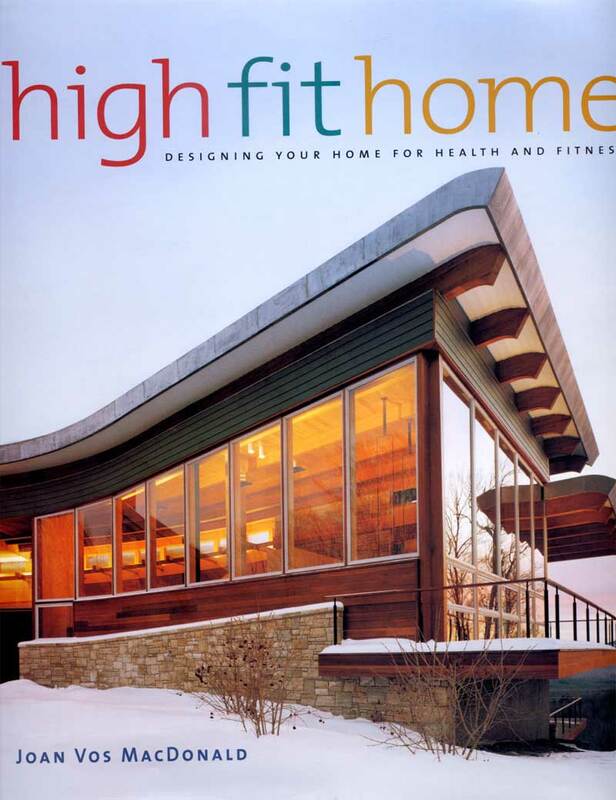 If the price tag for Harigian’s service (a starting fee of $75,000) exceeds some homeowners’ budgets, the spirit with which he pursues his dreams and helps clients pursue their exercise goals may inspire a reshuffling of some home-design priorities. “No other room in your house will do anything for your health,” said Harigian.